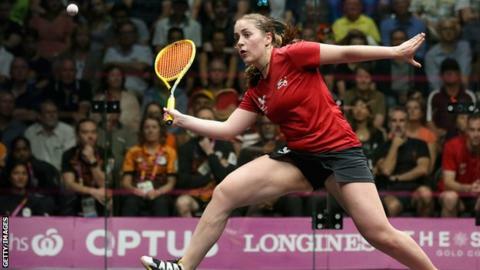 Tesni Evans has become the first Welsh woman to reach the top 10 of the world squash rankings. Evans, 26, made history in Philadelphia last month as she became the first Welsh player to reach the semi-finals of the US Open Squash Championships. Evans' performance at the US Open sees her rise to nine in the world rankings. The Rhyl-based player also becomes the first Welsh squash competitor to reach the world's top 10 since David Evans managed the feat in 1992. "It is a massive achievement... it was right at the top of my list of goals," Evans told BBC Sport Wales. "Being the first Welsh women to do it makes it even more special, it makes you even prouder. "I am representing my nation and I am really happy to do that."